Thyroid hormones help regulate physical development, facilitate energy conversion in cells and affect the way your organs function. Your body uses potassium to facilitate the proper function of nerve and muscle cells. Low potassium is associated with high levels of thyroid hormones. Treating low potassium caused by excess thyroid hormones involves lowering thyroid hormone level. Hypokalemia is defined as low levels of potassium in your blood. Normal blood potassium levels should be between 3.6 mEq/L and 4.8 mEq/L, MayoClinic.com says. Hypokalemia means your blood potassium levels have dropped to less than 2.5 mEq/L. This causes symptoms such as weakness, fatigue, muscle cramps and arrhythmia to occur. Hypokalemia is fatal if left untreated. Thyrotoxic periodic paralysis is a condition that induces moments of muscle weakness and paralysis in people with elevated levels of thyroid hormones. This form of hyperthyroidism causes your potassium levels to drop. Muscle weakness or paralysis caused by low potassium commonly occurs in the shoulders and hips and typically lasts between three hours and a whole day. Hyperthyroidism also causes nervousness, irritability, increased perspiration and insomnia, KidsHealth notes. Diagnosing potassium and thyroid problems involves testing the blood to determine blood potassium and thyroid levels. Treating hyperthyroidism sometimes requires surgical intervention to remove most of the thyroid gland. Thyroid replacement hormones are usually given after surgery to prevent thyroid hormones from dropping below normal levels. Treating low potassium involves the use of potassium supplements. 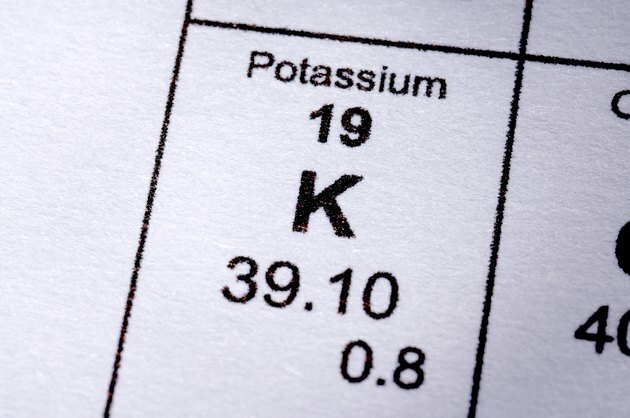 Eating foods that have potassium helps prevent hypokalemia. Foods like bananas, bran, kiwi, peaches and tomatoes contain potassium. If your potassium levels remain low for a prolonged period, complications such as kidney damage are likely to occur. Consult a doctor before taking potassium supplements in order to determine your treatment options. The most common reason for hypokalemia is excessive potassium loss during urination or via the digestive tract, MayoClinic.com says. Your blood potassium levels decrease when you have diarrhea or take diuretics such as water pills. Vomiting and chronic kidney failure also cause potassium loss. Hypokalemia due to insufficient potassium in your diet is generally rare unless your diet mostly consists of food that does not contain potassium.